This year Lilian Cannam Kindergarten was very excited to participate in the Victorian Premiers’ Reading Challenge. 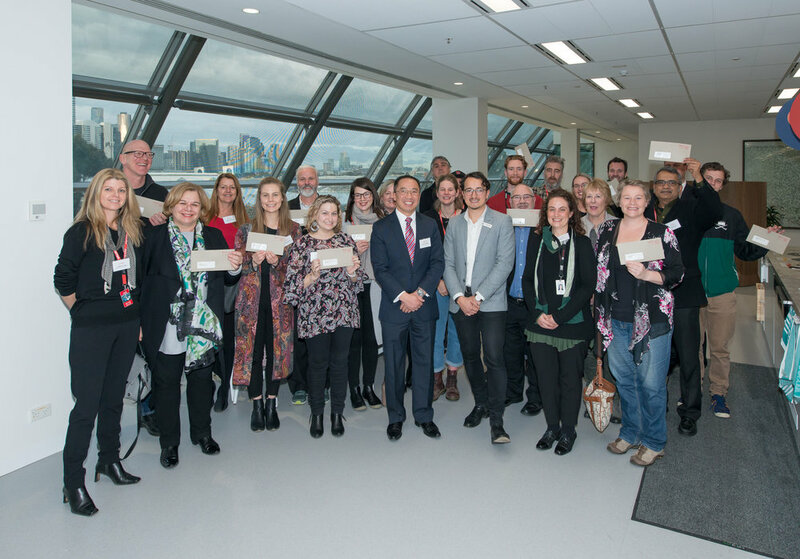 The Challenge was open to all Victorian children from birth to 16 years in recognition of the importance of reading for literacy development. To take part we challenged the children to read or have read with them 40 books at kindergarten between February and September. We are thrilled to announce the children met the Challenge and we look forward to receiving our certificates of achievement signed by the Victorian Premier. The books on challenge book list are diverse in style and contain a broad range of themes and ideas. On Tuesday the 31st July Jessica Rose (President) and Tracey Davey (Director) visited the Toyota Motor Corporation in Port Melbourne. Lilian Cannam Kindergarten Inc has been awarded $1,000.00 for our Sustainability and Seedlings Program. Our children take wonderful care of our worms, as well recycling food scraps, minimising food waste that goes to landfill and creating natural garden fertiliser. Our worms make two products for our garden: Vermicast (aka Worm Poo) and Worm Leachate (aka Worm Juice). These products are abundant in beneficial microorganisms and enzymes that support the quality and structure of your garden soil. This grant will help to buy a bigger worm farm and a rotational composter. The children have done a great job bottling our Worm Juice and selling it to families for use in their garden. Thank you to Jessica and our committee who support us in reaching our goals. We made it to the finish line! Lilian Cannam Kindergarten has just been a part of the biggest and most impactful Plastic Free July challenge yet. This year, we joined around 3.4 million participants in 177 countries across the globe to #ChooseToRefuse single-use plastic and help reduce the worldwide epidemic of plastic waste. The children made reusable shopping bags for vegetables. Lilian Cannam Kindergarten supported Red Nose Day by holding a Little Rockers Red Nose Disco presented by iHeartRadio. We can’t thank you enough for your support with fundraising on the day and your contributions to our fundraising page. With 2018 being the 30th anniversary of Red Nose Day we have been overwhelmed by everyone’s generous support. Our disco was a big success! Our fundraising goes towards Red Nose programs like the Sleep in Pregnancy Pilot Trial, led by Dr Adrienne Gordon of the Royal Prince Alfred Hospital, University of Sydney, to explore maternal sleep position in late pregnancy as being a potential risk factor for stillbirth. Our Visual Art Teacher, Olivia Penna, Graduates. We are delighted to celebrate this milestone event, achieved by our Visual Art Teacher-Olivia Penna. We are very proud of Olivia, who has worked so hard to achieve her Master of Teaching (Early Childhood) with a Graduate Diploma in Educational Research, from the University of Melbourne. Olivia’s art experiences at Lilian Cannam teach the children to think openly, create new meaning, be more tolerant of others’ differences, and gives them the courage to take risks. The children are also getting very excited about exhibiting their own works at the St. Kilda Town Hall on December 1st 2018. Congratulations to our Director: Tracey Davey. 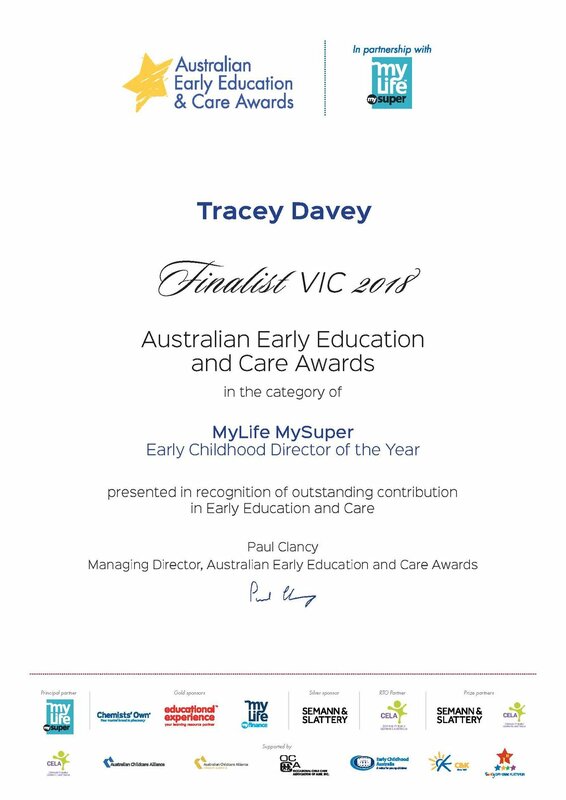 Tracey has been named a Finalist in the Director category of the 2018 Australian Education and Care Awards. This is a great achievement and one of which we are very proud. This year, 116 Finalists were selected from over 1,693 nominations. The judging panel will assess every Finalist against a strict set of criteria. Based on their assessments, the State Winners will be selected. Congratulations again Tracey and all the very best in the next stage of judging. During National Reconciliation Week all of our children were lucky enough to attend “You and Me, Murrawee” at the Royal Botanical Gardens. This program gives the children a greater understanding and respect for Aboriginal culture, in particular the local Kulin Nation. Through the story-book by Kerri Hashmi, students explore indigenous plants in the Children’s Garden, collecting plant treasures and using Aboriginal tools. Experiences included grinding and painting with ochre, meeting Waa (the Raven) and making a ‘belonging’ handprint to take home. We use Storypark to involve you in your child's learning. At Lilian Cannam we use Storypark to document and support children’s learning, together with families. We can record and communicate learning as it happens via photos, video, audio and observations within a secure online environment. We receive instant feedback and plan new ways to extend children’s unique interests and abilities. 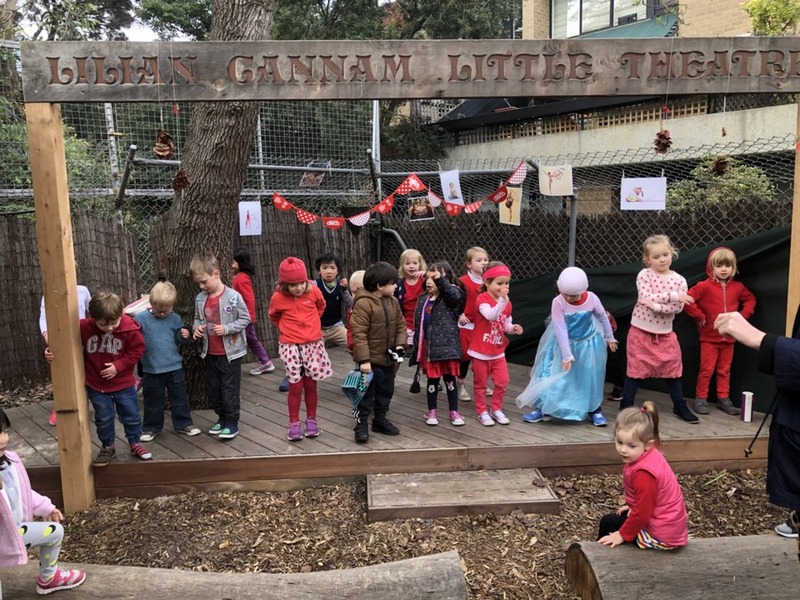 At Lilian Cannam Kindergarten we celebrate and recognise parents and families that are part of our community on Mother's Day and Father's Day. Mother's Day and Father's Day is also a wonderful opportunity for recognising the diversity of family structures. Inclusive celebrations serve as an important learning experience by providing opportunities to discuss and acknowledge the many kinds of families in our communities and the many caring adults who are in children's lives. In 2017 Katherine Lewisohn worked hard with staff, parents and children to promote responsible policies and practices at Lilian Cannam. Our 2018 Sustainability Team headed by Nicki Mete, continue this important work. Composting, worm farms, gardening and providing a natural environment successfully engages children. However, these are only one of many ways we can teach sustainable development. This week we took delivery of our “recycle station” bins. The children have been using our recycle stations to practise their sorting skills. We have been looking at packaging labels and recycling symbols to help us to identify how different types of packaging can be recycled. Our transparent recycling bins allows us to see what goes in each bin, promoting the correct separation of waste. On Sunday Earth Day has encouraged us to “Help End Plastic Pollution” by finding out how many plastic items we consume every year and make a PLEDGE to reduce that amount. The children have been collecting all plastic that comes into the kindergarten! We hope to work together to reduce this amount in the future.